As with so many things in life, MyHouseMyStreet (MHMS) is part of a larger whole. 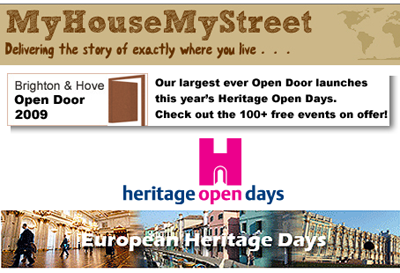 MHMS sits within Brighton & Hove Open Door (BHOD), which is itself a part of the UK’s national celebration known as Heritage Open Days (HODs). This event is, in turn, a part of the continent-wide European Heritage Days (EHDs). The Foundry Street Event (TFSE), staged during Brighton & Hove Open Door 2008 (BHOD 08), introduced visitors to the history of Foundry Street and those who lived there between the 1820s and the 1970s, by displaying posters listing the street’s residents and the jobs they did. The event was very well received and numerous requests were made for similar events to be staged in other streets during subsequent BHODs.